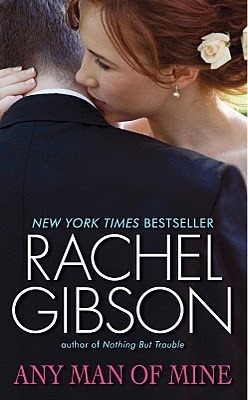 Rachel Gibson's Chinooks Hockey Team series just keeps getting better and better. So far every book I have read in this series has not left me with any disappointment at all. Any Man Of Mine is currently book six of the series, and honestly, my favorite so far in the entire series. Autumn has finally learned to let go of her past with Sam and has vowed to never let Sam or any other man have an effect on her the way he did. She has finally moved on and her career is booming. Sam obviously doesn't think about Autumn or that amazing weekend they spent together, but all that changes when they see each other again at his teammate's wedding. Autumn happens to be the wedding planner and knew she would see Sam again, but did not think he would still be able to stir any type of emotion in her. I was easily pulled into Autumn shoes. It was heart breaking everything she went through with Sam. She quickly fell in love with Sam and actually thought that it was something real in Vegas. She had no idea Sam would just pick up and leave and act like it never happened. Autumn was heart broken and left with so many unanswered questions. Now that they are face to face again Sam can't help but remember what exactly it was that pulled him to Autumn in the first place. As they try to build a friendship with each other, somewhere down the line they end up back in each others arms. Autumn changed Sam back in Vegas and neither one of them knew it. He was having a rough time and wasn't ready to be with Autumn then. Now, he is seeing her and their relationship in a whole different light. It was very emotional and touching. Not something I would normally pick up, but I liked reading your thoughts. I'm a bit intrigued by Sam and his realizations.